In July 1888, Mr. David N. Harper, a graduate of the University of Pennsylvania, took over his duties as the first chemist in the agricultural experiment station established two months earlier. He was" ... to have charge of the work in the Department of Chemistry, such as analyzes of soils, water, feed, fertilizers, forage plants, milk, butter, cheese ...". He began several research projects and it is interesting to note that his first paper dealt with the chemistry of wheat, a subject which is still one of the major projects in the experiment station. Professor Harper remained at University Farm for four years; during that time, the School of Agriculture was organized and the college work in agriculture was expanded. Thus, both research and teaching constituted the program of work in the then department of agricultural chemistry. Professor Harry Snyder came to University Farm from Cornell in 1891 as professor of agricultural chemistry. In 1907 he was made chief of the reorganized division of agricultural chemistry and soils. During his eighteen years of service, Professor Snyder developed the station work on the chemical composition of foods and feeds in relationship both to the composition of the soil from which they arose and to their nutritive value. His interests were largely directed to investigations on milk and on the cereal grains and bread. These studies led to the publication of many scientific and technical articles in addition to four textbooks, "Dairy Chemistry", "Soils and Fertilizers", "The Chemistry of Plant and Animal Life", and "Human Foods and their Nutritive Value". 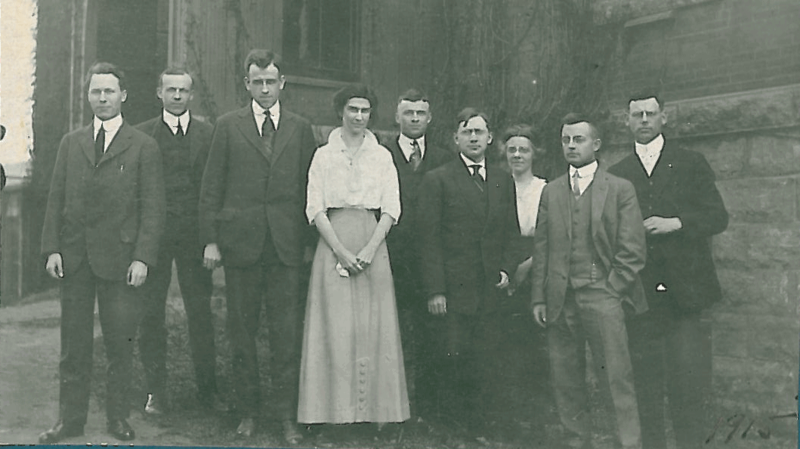 When Professor Snyder resigned in 1909 to become chief chemist of a local milling farm, the work was continued for the next four years by Professor Ralph Hoaglund. The latter resigned in 1913 to accept a position with the Bureau of Animal Industry at Washington. By 1913, the division of agricultural chemistry and soils had expanded to the stage where it seemed desirable to separate the activities into the two divisions of soils and of agricultural biochemistry. Professor Roscoe W. Thatcher was made chief of the division of agricultural biochemistry and four years later he was promoted to dean of the Department of Agriculture. During the later years of his life he was, in turn, director of the Geneva (New York) Experiment Station and president of the University of Massachusetts. Professor Thatcher is remembered for his administrative abilities and his name was memorialized in a faculty-graduate student apartment building on campus that stood until the early 1990's. Dr. Ross Aiken Gortner became chief of the division in 1917 and continued in office until 1942 when he was succeeded by the late Dr. LeRoy S. Palmer, who directed the division's activities for two years. Gortner Avenue and Gortner Laboratory of Biochemistry are so named in honor of Dr. Gortner's service to the University and honor he brought to it. Dr. William F. Geddes served as chief of the division and/or Head of the Department from 1944-1961. The division of agricultural biochemistry was housed in Snyder Hall, named in honor of Professor Harry Snyder . We are told that the first chemical laboratory was established in a room which can today only be identified as a part of the veterinary building. In 1903, the division moved into a new building, now known as the soils building, and remained there until Snyder Hall was built in 1927. Reference has already been made to the studies in the field of cereal chemistry pioneered by Professors Harper and Snyder. When the latter left the university, Dr. C.H. Bailey (after whom Bailey Hall is named) continued the work and expanded the program to include basic studies on wheat and the changes occurring during storage, the effects of the milling procedure on the flour, and the changes taking place during fermentation and baking. Because of the importance to the plant breeder in the final evaluation of any new variety of wheat, considerable study was given to development of procedures for the estimation of the baking qualities of wheat flours. One of the outstanding achievements of the Minnesota experiment station is the development of Thatcher wheat, the first hard red spring wheat resistant to stem rust which had satisfactory milling and baking qualities. This wheat has been widely grown in the hard red spring wheat producing areas of the northwest since it was first released to a limited number of growers in 1934. Its development was only possible through the cooperative investigations carried on by the divisions of agronomy and plant genetics, plant pathology and agricultural botany, and of agricultural biochemistry. Dr. Bailey was the first editor of "Cereal Chemistry" , a bimonthly journal published by the American Association of Cereal Chemists to provide a medium for the exchange of scientific information in the field. In 1938 he left the division to become associate director of the experiment station, later he was promoted to dean and director of the department of agriculture. Dr. William F. Geddes was made a professor in the division in charge of the section of cereal chemistry. Dr. Geddes contributed generously to the scientific and technical literature in the field of milling and the food industries and is the present editor of "Cereal Chemistry". The division of agricultural biochemistry was favorably known throughout the world for its work in cereal chemistry and was recognized as one of three institutions in the country at the time which offered advanced work in the field. This is manifested by the fact that the American Association of Cereal Chemists awarded the Osborne Medal for outstanding achievements in the field of cereal chemistry to Dr. Bailey in 1932, to Dr. Gortner in 1942 and Dr. Geddes in 1950. In addition to these staff members, the medal has been awarded to Dr. MJ. Blish and Dr. Betty Sullivan, who received their post graduate training under Dean Bailey. This medal was first presented in 1928 to Dr. T.B. Osborne, the father of modern protein chemistry and after whom it was named. Dr. Gortner came to University Farm from the Carnegie Institute at Cold Spring Harbor, New York, with an acquired deep interest in biology imposed upon his academic training in chemistry. He had earlier been interested in the melanins and related pigments, hence he turned his attention to the organic constituents of soil humus. From this he was led to consider the humin fraction of a protein hydrolysate. His reading and experiments on proteins convinced him that an understanding of colloidal phenomena was essential to an understanding of the properties of proteins, particularly as they are involved in vital phenomena. He was an inspiring lecturer and an enthusiastic experimenter in the fields of the proteins and the colloids. However, he had a wide knowledge of the whole field of biochemistry as revealed in his well known text, "Outlines of Biochemistry" . For many years, the experiment station projects had dealt with the basic constituents which make up the tissues of plants and of animals, the roles which these substances play in the life processes, and the changes which they undergo when converted to foods or used as raw materials for industrial processes. In 1920, a small animal laboratory for feeding experiments was organized by Professor R. Adams Dutcher and Dr. Cornelia Kennedy. At first their studies were concerned with the then new field of the vitamins. At the same time Dr. LeRoy Palmer (the namesake of Palmer Classroom building on the site of what now is the Ecology Building) began a comprehensive study of the constituents of milk. When Professor Dutcher left to become the head of the department of agricultural chemistry at Pennsylvania State College, Dr. Palmer assumed the leadership in the studies on animal nutrition, at the same time continuing his researches in dairy chemistry. He initiated experiments to determine the biological value of the various proteins and the requirements of animals for the various vitamins and minerals. In cooperation with the division of dairy husbandry, a nutritional problem due to a phosphate deficiency in the feeding stuffs grown in certain areas of the state was studied and the corrective measures were determined. For lack of space these experiments were first housed in the basement of Haecker Hall. When Snyder Hall was built, space was provided on the third floor for the animal nutrition laboratory. Dr. Palmer received the Borden A ward in 1939 in recognition of his outstanding research in the chemistry of milk. This award is administered by the American Chemical Society and Dr. Palmer was selected as the first recipient. He was particularly active in applying the principles of colloid chemistry to a study of the constituents of milk and the changes which they undergo during various manufacturing processes. Over the years the teaching program of the division consisted of several courses adapted to the needs of students in the various curricula of the school and the college, together with those designed to train professional chemists. For the latter group the instruction is built upon the basic courses in inorganic, organic, physical and analytical chemistry as well as related subjects, all of which are taught elsewhere within the university. The division offered such basic courses in the field of biochemistry as colloids, proteins, carbohydrates, lipids, enzymes, microbiochemical assays and animal nutrition, together with the more specialized courses in dairy chemistry and cereal chemistry. In the late 1950' s a curriculum in food technology leading to the degree of bachelor of science was instituted under the leadership of Dr. Geddes. Graduate training is an important feature of the work of the division of agricultural biochemistry. The enrollment of graduate students from 1920 to 1950 greatly outnumbered the undergraduate majors. During these years it was necessary to restrict the numbers of students admitted to graduate work to keep within the limits imposed by laboratory facilities. 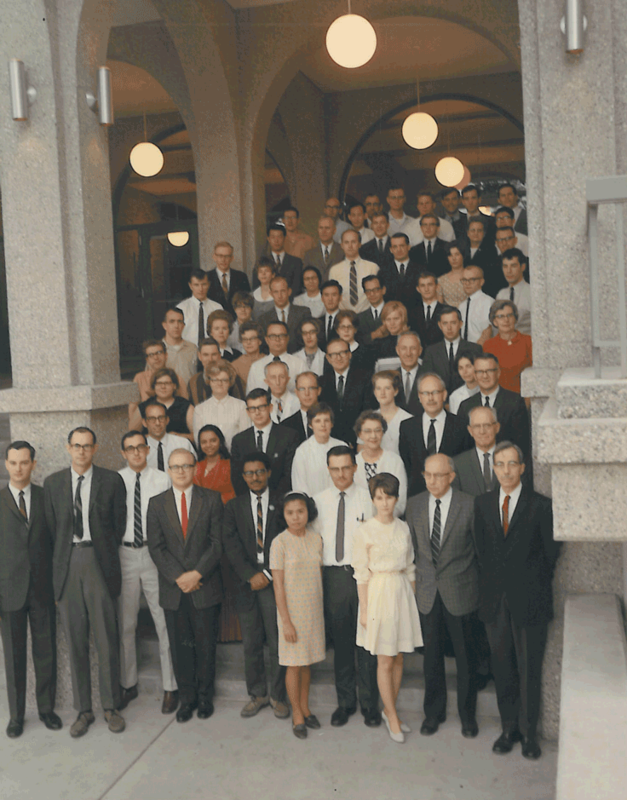 By the mid­1950's the faculty consists of ten full-time appointees and five who devote part-time to instructional work. The staff included six part-time teaching assistants, together with twenty-seven part-time and two full-time research assistants. Seven of the full-time staff were members of the graduate school faculty; as a consequence of the high enrollment of graduate students, the student-faculty ratio was, at the time, the highest of any division or department in the graduate school of the university. In the mid- to late 1940's and through the early 1950's the division was the home of Dr. Paul Boyer. Dr. Boyer was internationally recognized for his seminal studies on energy transformations in metabolism, he is best known for his studies on ATPases. master's degree in the division. These people assumed research, teaching and administrative positions with a great variety of duties and were as widely scattered as were the locations from which they came to study at University Farm. In 1954, Professor Geddes proposed to the Dean of the Institute of Agriculture that the name of the Department of Agricultural Biochemistry be changed to the Department of Biochemistry. This proposal encountered considerable opposition from the Department of Physiological Chemistry in the Medical School which was equally well qualified for the same name. There resulted a lively academic interchange of letters and responses in which neither department was able to make a convincingly sole claim to the name, Department of Biochemistry. In 1963 the name of the department was changed to Department of Biochemistry. At about the same time the Medical School department also became the Department of Biochemistry. This generated the unusual situation of there being two Departments of Biochemistry at the Twin Cities campus of the University of Minnesota. At that time, a new addition to Snyder Hall was in progress and in September 1965 the department was moved administratively from Agriculture and was designated as the Department of Biochemistry in the newly formed College of Biological Sciences. As a result of a natural evolution of emphasis in the field of general biochemistry and in accord with the removal of the department administratively from Agriculture to Biological Sciences, its applied aspects and activities assumed a lessened degree of emphasis, those having to do with the products of organisms as such have been assigned secondary emphasis to those having to do with the chemistry of the living state itself, i.e., metabolism, enzymes, energy transformations, biosynthesis, biochemical genetics, comparative biochemistry, cellular composition in relation to cellular organization, relation of structure at the molecular level to biological function, etc. The department continued established functions of teaching service courses concerned with biochemistry in the undergraduate curricula of the College of Agriculture, Forestry and Home Economics, the College of Liberal Arts, the Institute of Technology, and the College of Biological Sciences. A major in Biochemistry in the Graduate School was administered jointly with the Department of Biochemistry of the School of Medicine. Under this Graduate School program, entrance requirements, initial course work taught at the graduate level and basic requirements for the granting of the M.S. and Ph.D. degrees are maintained in common between the two departments which otherwise remain autonomous within their respective areas of administration. A strongly physical and chemical approach to biochemistry is maintained in this graduate program. The offerings by the Department of Biochemistry (CBS) constitute the principal focus of instruction and research in general biochemistry (plant and animal) at the University of Minnesota. Dr. LaVell M. Henderson was recruited from Oklahoma State University in 1963 to become the head of the department. The mid-sixties were years in which many universities were actively expanding in the basic sciences. Research support was plentiful and many institutions added faculty and built new laboratory facilities. 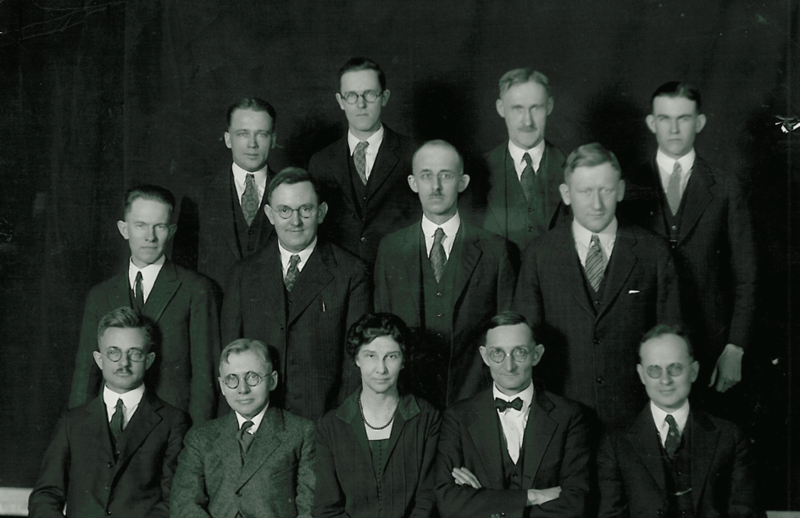 Soon after Dr. Henderson's arrival, plans were begun to expand the number of faculty. Over the next four years, seven faculty appointments were made so that by 1967 the faculty numbered 14. Laboratory and office space was provided in the newly constructed Gortner Laboratory of Biochemistry which was first occupied in 1966. The Palmer Classrooms building was built at the same time. The College of Biological Sciences (CBS) was created in 1965 by bringing together the Department of Biochemistry from the Institute of Agriculture, the Departments of Botany and Zoology from the College of Liberal Arts, and by establishing two new departments (Genetics and Cell Biology; and Ecology and Behavioral Biology). Within the framework of CBS as an upper division undergraduate college, the Department of Biochemistry defined an undergraduate curriculum for a major in biochemistry. Prior to this time, biochemistry was generally considered to be a graduate level discipline because it was based on such extensive prerequisite work in both chemistry and biology. Soon after many other universities across the country established an undergraduate curriculum in biochemistry. Biochemistry majors at the University of Minnesota fulfilled the core curriculum for biology majors and also took several additional courses in chemistry and biochemistry. This very demanding undergraduate curriculum attracted some of the best qualified and motivated students at the University. The number of undergraduate majors in biochemistry ranged from 20 to 30 throughout the decades of the 70's and the 80's. In the early 1970's through the leadership of Richard Gray, several prominent citizens who lived near Lake Minnetonka, established a research institute to focus on the fundamental science associated with fresh water. Although established with private funds, the founding donors desired that the institute have a close association with the University of Minnesota. All primary staff appointments were to have tenure appointments in regular units of the University. The Freshwater Biological Institute was established and a building erected on Lafayette Bay of Lake Minnetonka. The entire physical facility was subsequently donated to the University. Several years later the institute became known as the Gray Freshwater Biological Institute (GFWBI). The first director of the GPWBI was Dr. John Wood whose tenure home was in the Department of Biochemistry. Dr. Henderson stepped down as department head after serving eleven years (1963-1974). He later served as Associate Dean of CBS. After considering several prominent candidates from across the country, Dr. Finn Wold was selected to be the next head. During his five years of service as head (1974-1979), a major development was the increase in the degree of cooperation with the Department of Biochemistry in the Medical School. In anticipation of the vacancy of the headships of both departments that would occur in 1974, a special review committee determined that the faculty of both departments were strongly in favor of maintaining the departments as separate entities. However, the move of Prof. Finn Wold from the Medical School department to become head of the CBS department, marked the beginning of a period of increased cooperation between the two departments. The faculty of both departments gradually came to the realization that the dual department approach to graduate study was an unnecessary duplication which caused considerable confusion not only within the university but also among potential graduate student applicants. Consequently, the extent of cooperation gradually increased in the graduate program. The use of a written preliminary examination to evaluate the progress of first year students from both departments was begun in the summer of 1978. For a number of years, each department maintained its own seminar program, but in the late 70's, the seminar programs were merged into a single seminar series in which seminars were on alternate campuses on alternate weeks. Visiting seminar speakers usually visited with faculty on both campuses. 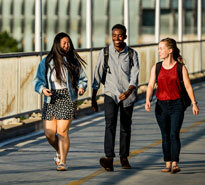 At about the same time, the graduate admissions process was changed so that students were admitted to the graduate program with the option of choosing a faculty adviser from either department. 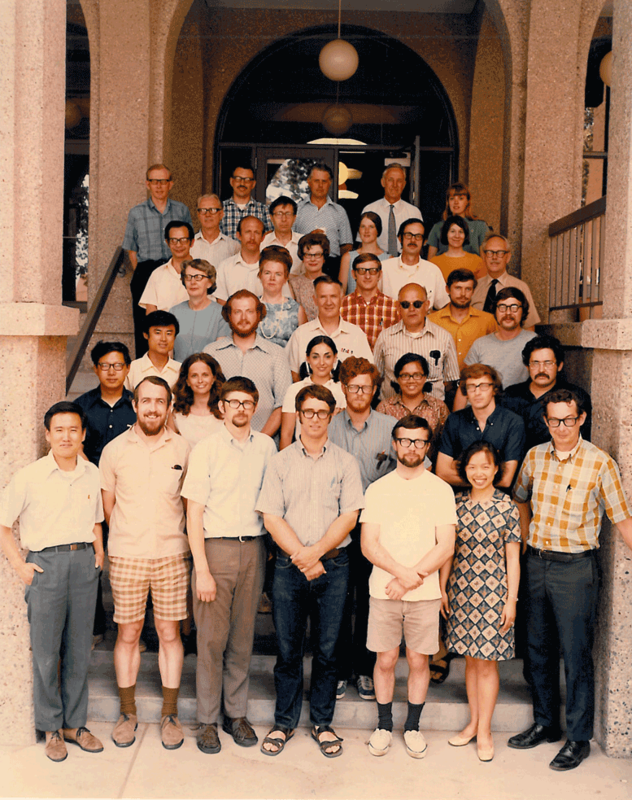 The steering committee became known as the Biochemistry Coordinating Committee and the graduate program began to be viewed as a unified program involving faculty in both departments. Dr. Wold's successor as head was Dr. Victor Bloomfield who was selected from within the department. For many years continuity in the departmental office was maintained by Henrietta Novy Miller, who began her service as a secretary and was Assistant Administrator when she retired in 1980 after 36 years of service. Of particular note was Henrietta Miller's enthusiasm for maintaining contact with the graduate students who had studied in the department during that period. Her service and dedication to the department is remembered through the Henderson-Miller award given annually to an outstanding undergraduate biochemistry major. An important step in improving interaction between personnel of the two Departments of Biochemistry as well as enhancing the concept of the unity of the graduate program was the establishment of the annual graduate program retreats. Profs. Victor Bloomfield (CBS) and Harry Hogenkamp (Medical School) developed the idea of the retreat and brought it to fruition. The first such retreat was held at the Biological and Forestry Research Station at Itasca State Park during the first weekend of October in 1984. Faculty, graduate students, post-doctoral fellows, and laboratory technical staff gathered for two days of intensive reports of progress from the faculty research groups. Because of the large number of faculty in the graduate program and the limited time available at a weekend retreat, each group was given the opportunity to report in alternate years. The annual retreats have been especially helpful in introducing new graduate students to the program and have helped substantially in strengthening the cohesiveness of the graduate program. The Biological Process Technology Institute (BPTI) was spawned in 1985 after several years of intensive planning and groundwork spearheaded by Dr. Victor Bloomfield. BPTI brought together the academic expertise in the departments of biochemistry, microbiology, chemistry and chemical engineering to develop a unit which would focus on scale-up processes to make laboratory procedures operational on a larger scale. Dr. Michael Flickinger became the first director of the BPTI with his academic tenure home in the Department of Biochemistry. Additional appointments to BPTI have tenure homes in other departments. BPTI labs were located on the second and third floors of Snyder Hall, eventually displacing the teaching laboratories of the Chemistry Department. The central laboratories of BPTI were developed in the basement of Gortner Laboratory in space which included two undeveloped areas known as the" sand rooms". The offices of BPTI were located in the area that had at one time been occupied by the biochemistry library before its move to the fourth floor of the Biological Sciences Center. A substantial turnover of faculty occurred in the mid 1980's. Six faculty members retired over a span of five years (Drs. 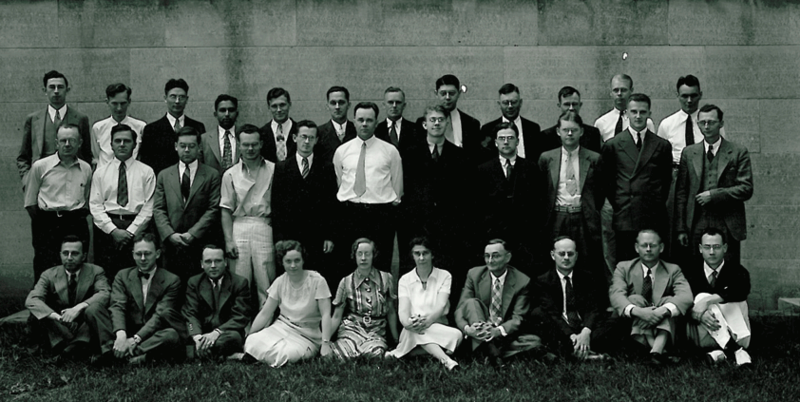 Henderson, Jenness, Kirkwood, Glass, Dagley, and Liener) and four others were lured away to positions elsewhere (Dr. Wold to University of Texas at Houston; Dr. Gander to University of Florida, Dr. Warner to the National Institutes of Health, Dr. Messing to Rutgers University). Consequently, a major effort of the department was devoted to recruiting new faculty and integrating them into the department. Faculty hired during this period included Dr. William Sharrock, 1984, Dr. Anath Das, 1985, Dr. David Bernlohr, 1985, Dr. Bianca Conti­Tronconi, 1985, Dr. Michael Raftery 1989, Dr. Bridgette Barry 1989, and Dr. Tian Tsong 1989. That the recruitment was successful is indicated by the fact that at the close of the decade, the amount of research support generated by the department faculty reached record levels. 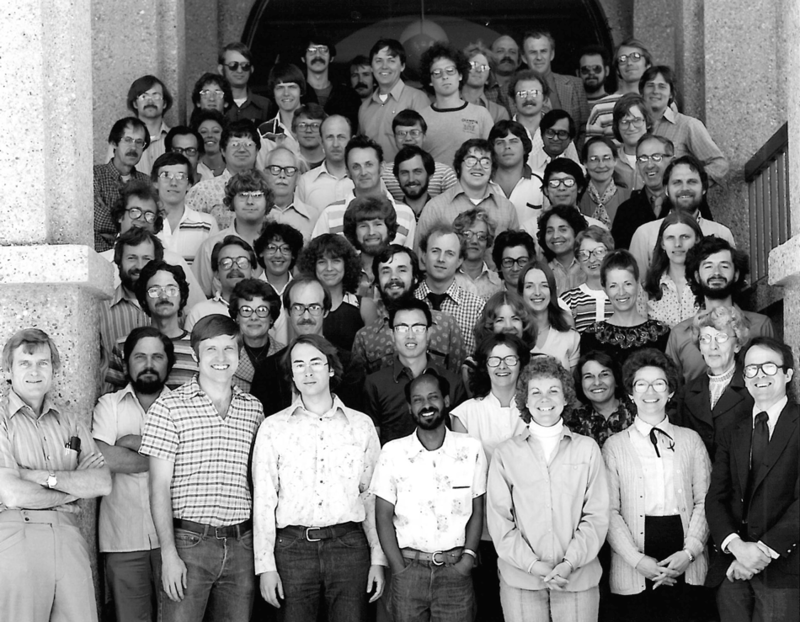 The combined graduate program in Biochemistry grew substantially in the 1980's. Total applications grew from 80 in 1982 to 176 in 1991. 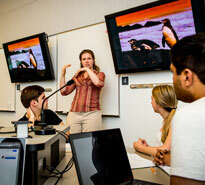 Students in the program making satisfactory progress toward degrees numbered about 75 in 1982 and 116 in 1991. After devoting twelve years as department head (1979-1991), Dr. Bloomfield elected to relinquish the headship so that he might devote more time to his research program and other professional commitments including service as the editor of the Biophysical Journal. After a national search, Dr. Norma M. Allewell of Wesleyan University was selected as the next head of the Department of Biochemistry beginning in September of 1991. Dr. Norma Allewell served as head of the department of Biochemistry from 1991 to 1995. During this time she was responsible for the hiring of additional faculty, including Drs. Jeff Simon and Ann Rougvie. In 1993 Larry Wackett moved his research group from the Gray Freshwater Biological Institute laboratories to Gortner Lab. 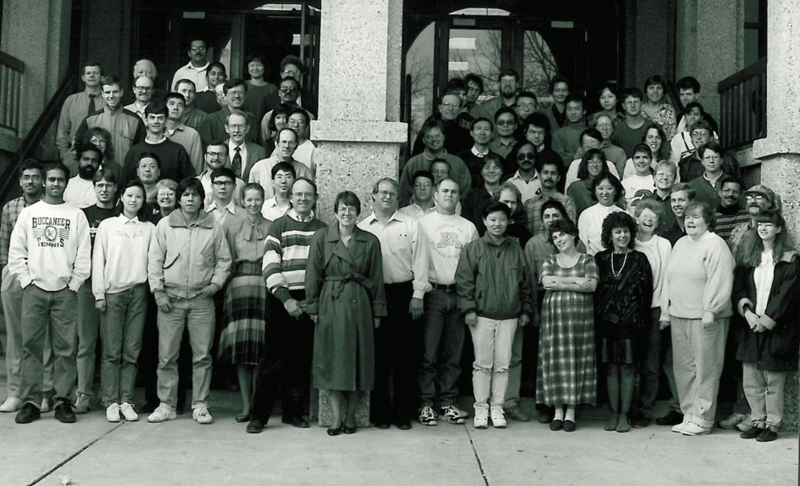 In the 1990's the department prospered and achieved considerable national prominence in the area of biophysical chemistry. Professors Victor Bloomfield, Norma Allewell and Clare Woodward were each elected to terms as President of the Biophysical Society. In 1995 Dr. Allewell resigned her post as head of the department to become Vice Provost for Arts Sciences and Engineering. D .R.Briggs, The Department of Agricultural Biochemistry, College of Biological Sciences, April 1, 1966.